While the importance of global energy and environmental issues is growing, development and increase of utilization of natural gas which is environment-friendly fossil fuel are required. As a result of increase in the environmental consciousness, countries around the world are making efforts to secure natural gas with low CO2 emission. The earthquake occurred in Japan on March 11th, 2011 and the subsequent nuclear reactor accident made a powerful impact on energy situations of each country. In particular, there has been more focus on natural gas electric power generation as an alternative to nuclear power generation and to secure natural gas for power generation is an important challenge. The position of natural gas is becoming more important. Besides the United States, unconventional gas resource is thought to have much potential and the existence of abundant unconventional resources has been confirmed around the world including Russia and China. The rise of unconventional gas has already made an impact on the world's LNG supply and demand. In the medium- and long-term, it is expected to accelerate the shift towards natural gas and to make a great impact on overall energy including oil and renewable energy. In the circumstances, the Northeast Asian Gas and Pipeline Forum (NAGPF), a nonprofit organization (NPO) which consists of five member countries including Russia, China, Korea, Mongolia and Japan established in 1997 has worked for the purpose of natural gas development and increase of natural gas utilization. 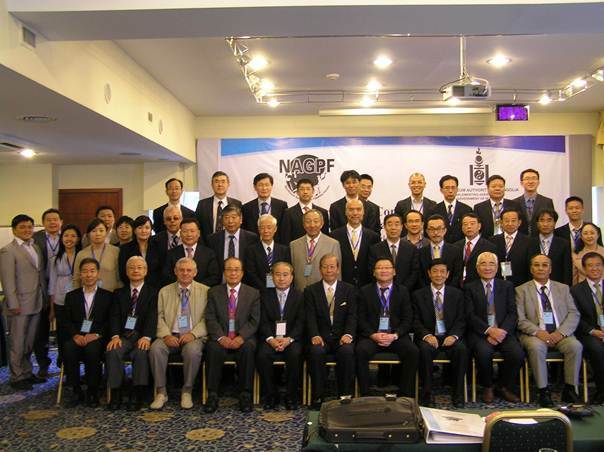 NAGPF has organized international conferences and conducted international joint researches in order to popularize the importance of natural gas development and utilization in Northeast Asia. NAGPF will hold the 12th International Conference on Northeast Asian Natural Gas and Pipeline in Ulaanbaatar, Mongolia in August 2011. The main objective of this conference is to discuss multilateral cooperation in natural gas development and utilization and building natural gas infrastructure, among interested parties from both supply side and demand side. We expect positive input and lively discussion from all the participants. "Multilateral Cooperation in Natural Gas and Pipeline in Northeast Asia"
Copyright© 2001-2014, Northeast Asian Gas and Pipeline Forum All rights reserved.